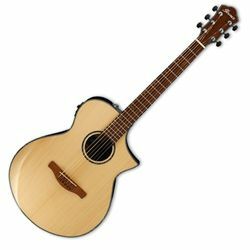 The Ibanez AEWC series represents Ibanez's commitment to bringing quality, innovative acoustics to the playing public. The new Ibanez AEWC300 is a wonderful example of this commitment, featuring quality tonewoods and appointments at a great price. A solid spruce top delivers warm acoustic tone, highlighting high and midrange coloring. Flamed maple back and sides add a touch of low end that balances out the overall tone, making this acoustic great for any style you desire. A mahogany neck with sonokelin rosewood fingerboard adds even more tonal support as well as stellar playability and response. When you are ready to plug in, a Fishman Sonicore pickup and Ibanez AEQ-SP2 preamp with onboard tuner provide solid amplified sound and tone controls at your fingertips. Acoustic players here at Sweetwater really appreciate the playability and quality of the Ibanez AEWC series.